It is a confusing time of year for a farmer. People come and go on vacation, coupled with a three day holiday weekend, and numbers can get confused. A CSA customer showed up yesterday to pickup. She has been sending others while traveling around, so it has been some time since we spoke. She went for a bit to the beach at Fire Island. If you have not been there, it is an island where everything is transported via bike and foot, or using wheelbarrow. No cars allowed, and only little stores. She had planned accordingly, packing lots of food, making certain the things she loves were with her. Our chicken, eggs and vegetables made the trip. The beach house owner also brought eggs. In a giant pack from a giant discount grocer. Immediately, she protected her stash of eggs from our farm, telling her friend not to touch them. The friend stated that eggs are eggs. No difference. Oh yes there is, and a blind taste test ensued. Which included the 12 year old son, who has already developed a palate and can distinguish between eggs. And then did so, from behind a blindfold. 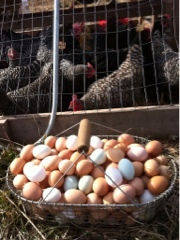 Of course the CSA member identified our eggs correctly too, but the 12 year old astonishes me. From the first day this spring when he tried our eggs he has been telling me of the vast difference between ours and any other. It just tickles me that a kid can tell the difference!